Why do 87% of sales reps hit their quotas in best-in-class organizations, while only 20% of sales reps hit their quotas in laggard companies? Best-in-class companies have empowered their sales teams by reducing friction in the last mile of the sales cycle and streamlining the lead-to-win process with a solutions like Configure-Price-Quote(CPQ). It’s not that CPQ didn’t exist earlier, in-fact all the leading companies used to offer these functions inbuilt in some form or the other. As you plan to invest in new customer & sales management tools to improve customer experience and sales force effectiveness, it’s imperative to have a best-in-class Pricing / Quote management tool that is well integrated with your CRM to enable your global sales teams. The impact of CPQ tools is encouraging and as it can enable organizations sale force get the competitive advantage over others. CPQ redefines how sales and service representative configure products, price with precision & then generates Quote for customer. CPQ implementation offers, sales users speed and flexibility in making product offerings to its customers with accuracy and precision. 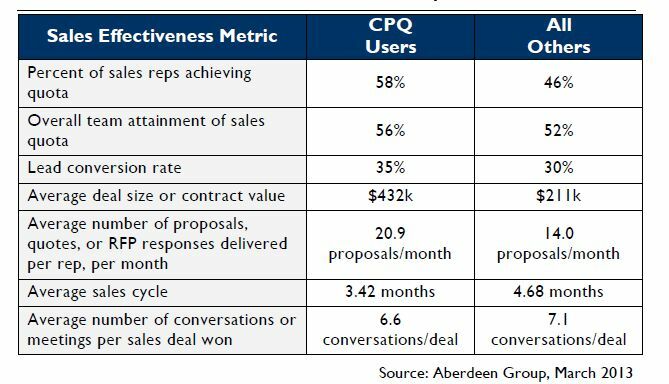 Aberdeen Group reveals that the 58% of the best-in-class firms——currently deploy CPQ technologies, and remaining 46%—indicate a plan to do so within the next 12 months. Also shows key improvements in sales effectiveness metrics for organizations with CPQ implementations. These improvements help sales users to focus more on the customer rather than internal systems, thus leading to improved customer satisfaction, higher chances of opportunity conversion and increased revenue for the organization. Some of the stats below are the testimony to the CPQ’s positive impact. There is definitely an increased focus and willingness from organizations today to upgrade the existing Quote and Pricing management systems to new cloud based CPQ systems. As the change in products and pricing is much more faster today, the need to provide accurate and immediate quotations to customers has become the need of hour. This cloud based CPQ system which offers all this combined package has become the latest trend and catching up fast. CRMIT Solutions provides Pricing / Quote management tool with the ability to quickly create price quotes, linked to right business records (accounts, contacts, or opportunities) in your CRM. These price quotes allow field sales teams to provide quick & consistent quotes to the customers – thus, shortening your sales cycle and plug revenue leaks. CRMIT’s Quote Management application is available in multiple deployment models to support the current industry requirements. As per your requirements, you can opt to keep it as an On Premise (Installed) application within your firewall, or deploy it on a cloud (Amazon Web Services, Google App Engine etc.,), or let CRMIT host it for you. With this I conclude that today CPQ offers an integrated functionality that improves sales efficiency, effectiveness and fuels the sales revenue . Looking at the trends today and sales being getting more and more competitive daily, I am sure no enterprise architecture would be complete without an integrated CPQ tool. This entry was posted in Analytics, Cloud, CRM, Lead Generation, Quote and Order Management, Uncategorized and tagged configure, configure price, configure price quote, CPQ, CRM, crm quote, CRM++ Quote Management, Oracle, price, price quote, pricing, quote, quote generation software, Quote management, quote management solutions, quote management system, quote tracking. Bookmark the permalink. I’ve joined your rss feed and stay up for in search of more of your excellent post. After looking over a few of the articles on your website, I really appreciate your way of blogging. I saved as a favorite it to my bookmark website list and will be checking back soon. Please visit my web site as well and tell me your opinion.